This month's featured author is a historical fiction fan favorite known for her deeply evocative stories featuring oftentimes overshadowed women in history. 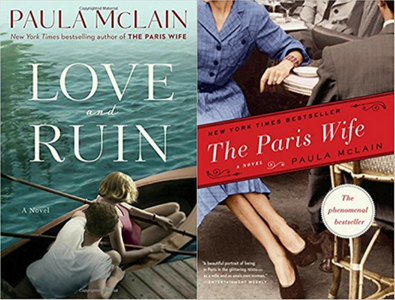 Her book, The Paris Wife, brought Hadley Richardson, the first wife of Ernest Hemingway into the spotlight. Her follow-up novel, Circling the Sun, told the story of aviator and author, Beryl Markham, a woman admired by Hemingway and often described as being far ahead of her time. Her latest book, Love and Ruin, focuses on Hemingway's relationship with his third wife, noted novelist, journalist and travel writer, Martha Gellhorn. Like all of her previous books, McLain's story is well researched, based on biographical accounts of Gellhorn's experiences, and sheds much deserved light on a fearless trailblazer in history.